In the old art, a book is a book with only blank pages where nothing happens. In the new art, a book may be the accidental container of a text expanding within the space. In the new art, a book is always an intention. And with this, poetry has lost nothing. 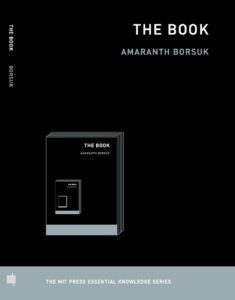 In the new art, a book may not be the true ground of communication taking place through words, here begins the new art of making books. In the old art, a book is the accidental container of a text, here begins the new art of making books. Élika Ortega is Assistant Professor at the Department of Cultures, Societies, and Global Studies and Core Faculty at the NULab for Texts, Maps and Networks at Northeastern University. She writes about digital literature, (not necessarily digital) media, intermediality, materiality, reading practices and interfaces, books, networks, digital humanities, and multilingualism in academia. Her projects include A Handbook of E-Lit Reading, an archive of instructions to read electronic literature works; and Binding Media: Print-Digital Literature 1980s-2010s, her monograph investigating print-digital works of literature around the globe.